Duplicating a layer in the middle of a stack of clipped layers creates a new layer that's not part of the clipped stack. It creates a new stack with everything above it clipped. 1. 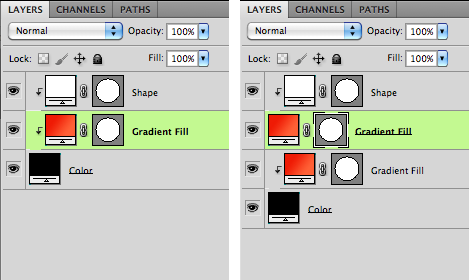 "Gradient Fill" is duplicated using command-J. 2. "Shape" is now clipped to "Gradient Fill", instead of all the layers being clipped to "Color". I'd expect a duped layer to remain part of the same clipping stack. It doesn't do anything to fix any problems Photoshop may have with duping multiple clipped layers at once. Thanks again David. That'll certainly help some of us until this gets resolved.